April in Bloomington is generally associated with daffodils, spring weather (excluding this year), morel mushrooms, Little 500, and course evaluations. Saying any combination of the words “end of semester course evaluation” to a faculty member tends to elicit an emotional response. Reading course evaluations can feel much like Pixar’s (2015) movie Inside Out. Depending on the course and semester, we may experience disgust, fear, joy, sadness, anger, or all of the above. Even though there is more than 80 years of empirical research on course evaluations, we still view them as a personal reflection rather than data reflecting student experience. The data from course evaluations inform two main activities on most campuses: course improvement and judgements about tenure and promotion. The research most cited by those arguing against course evaluations tends to focus on the second activity, performance judgement. (For highlights around this argument, view the infographic below.) But, what if we focus on course evaluations as a rich data source of student experiences that we can leverage to improve our courses and inform our SoTL work? 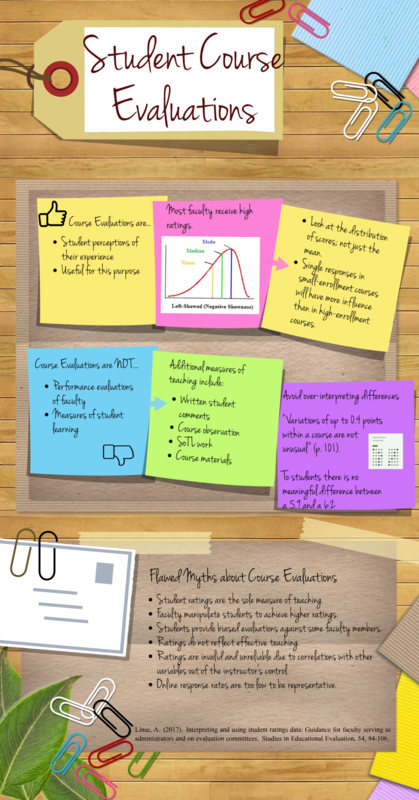 As a source of data, course evaluations generally consist of quantitative data (i.e. the ratings) and qualitative data (i.e. student comments). While the quantitative data provides a quick check of a course, this data is often negatively skewed, meaning that most faculty receive relatively high course evaluations most of the time. The qualitative data, on the other hand, can be the most useful and impactful. This is also the data that tends to have the greatest emotional impact. Start with the emotional read. Read through your evaluations and then walk away for some end of the semester self-care. When you are ready to approach your evaluations as a scholar, come back to them. Graph your quantitative data, looking for clusters and patterns in the data. You may have a few outliers, but most student responses cluster together. Avoid over-interpreting small differences in quantitative data. Remember that these scales are ordinal, not ratio, meaning the order of student responses matter, but not the difference between values. To students, there is not a big difference between a 3.8 and a 4.2. Next move into your qualitative results. Group like comments together. Discard comments that are irrelevant to the course, curriculum, or teaching. Create categories for your comments. Categories focused on teacher, curriculum, pedagogy, and class sessions can be helpful. Once you have your comments organized, you can either quantify them by counting the number of comments addressing the same issue, or you can categorize further into positive, negative, actionable, and out of your control. End by identifying two or three things to address for the next semester. If you are interested in unpacking and acting on your course evaluation data, consider registering for our upcoming workshop, Unpacking & Acting on your Course Evaluation on June 15, 2018. If you are unable to attend the workshop or would like to talk through your data one-on-one, contact the CITL to schedule an individual consultation. I don’t understand–can you clarify what you mean when you say, “the order of student responses matter”? So, What’s the Big Deal with Big Data and Learning Analytics at IUB? Devices in the Classroom: To Ban or Not to Ban? What Service Fits Your Course? 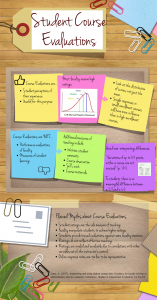 Ever wondered what it’s like to design a blended learning course? I’ve Got Top Hat (Clickers)…Now What?